Christmas wrapping takes me back to my teenage years when my sister and I worked at competing gift shops in town. You know the ones with the Royal Daulton china and the Crabtree and Evelyn hand creams. Before Aesop, hand thrown clay and Palo Santo sticks were a thing. Each Christmas would get progressively more competitive as we turned gift wrapping at home into a sport. The year we realised we’d gone too far I sealed my presents with initialed red wax seals and spent more on the wrapping than the gifts themselves. Skip a few years and my sister is studying Environmental Science and it was time to switch to using recycled newspapers to wrap or be met with a look of disappointment on Christmas morning. So, we found a way to get creative on a neutral canvas, and on boxing day, the paper was composted. To be fair, I was ready to hang up my fancy wrapping shoes. Wrapping that is simple and functional allows the tree be the real hero. Skip the bright Santa prints and shiny bows and the tree will twinkle on it’s own. There is nothing groundbreaking about the look of the ideas below, but the reason we choose certain materials and how we dispose of them makes all the difference. There is also an added bonus to recycled wrapping - it’s a saviour when you find that one forgotten present in the top cupboard or an unexpected family member turns up on Christmas morning and you need to wrap something quick smart. You’ve embraced the imperfect, so a gift wrapped in Sunday’s crumpled paper and a sprig of something from the garden becomes less disheveled, more considered. Here are a few of my favourite Christmas wrapping ideas, both doable and low impact. Depending on the size of your present, find old books, newspapers, or brown paper shopping bags for wrapping. 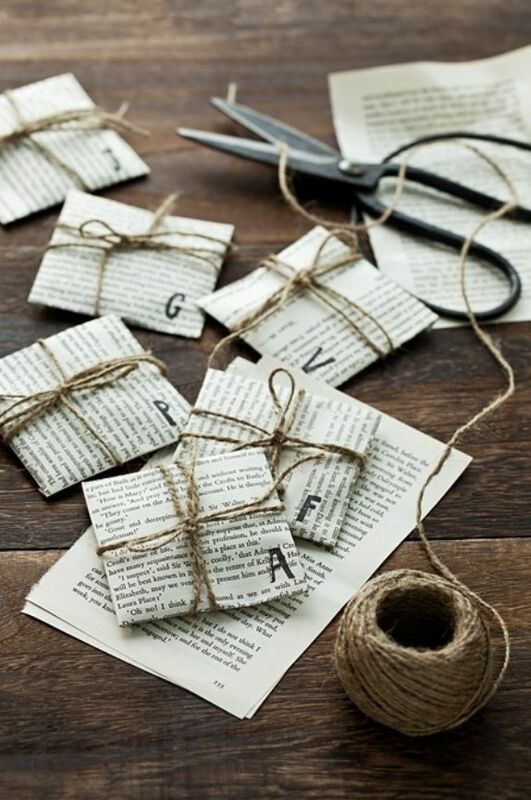 Use paper tape or natural twine to hold the shape so the paper can be easily composted or recycled. Add some organic decoration to the top like Eucalyptus, rosemary, pine or cinnamon sticks. It will all smell divine. This is my favourite way to wrap. I like to use old bed sheets, pillow cases, or shirts cut up into squares and rectangles to wrap my gifts. Either wrap the normal way (as you would with paper) or try the Japanese technique of furoshiki wrapping. Thin scraps of the same or contrasting materials can also be used as a tie. Keep your wrapping for next Christmas or another project. I also like to use some of my wraps (damp) to wrap my veggies to keep them fresh in the fridge. Basically anything that is not from the earth. Choose natural fibres over synthetic. Nylon ribbons or bows - you know the one’s you curl with a pair of scissors. Cellophane. Cellophane used to be made of cellulose (a natural fibre that decomposes naturally). These days it’s (mainly) made of synthetic fibres that do not break down. Opt for a thin natural muslin instead. Plastic tape and stickers. These cannot be composted or recycled. This could compromise a perfectly green gift. Try paper tape like this which can be recycled or composted with the paper or cardboard. Don’t stress if you’ve got a stack of shiny wrapped gifts from a cousin or family friend waiting under the Christmas tree. Or if you’ve already started wrapping and it doesn’t fit this philosophy. These ideas should be liberating and relaxed. There is always next year. Made locally in Sydney, Palm Palm Beach Black is about creating long-lasting home staples that get better with age. Using handpicked vintage denim and other sustainable materials to create beautiful cushions and homewares.